Mix in a big bowl the olive oil, butter, garlic, lemon juice, oregano, salt and black pepper. Add potatoes and toss until the potatoes are well coated. Arrange potatoes, cut side down, on a rimmed baking sheet and spread out into 1 layer. Roast potatoes until tender and tops are golden, bottoms are browned and crisp, about 35–40 minutes. Remove the potatoes from the oven, sprinkle with parsley, and serve hot. I used Fingerling potatoes but you can also use baby potatoes or Yukon Golds. 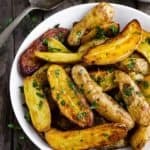 If the potatoes are too big just cut into wedges.